I am trying to set up webapi for postgresql in Ubuntu16.04 environment. Java version 8.0, maven version 3.3.9. Can someone please help me in fixing this problem or give any suggestions to resolve this. Check your POM XML in a code editor like NP++ or ATOM for hidden special characters or markup format errors. 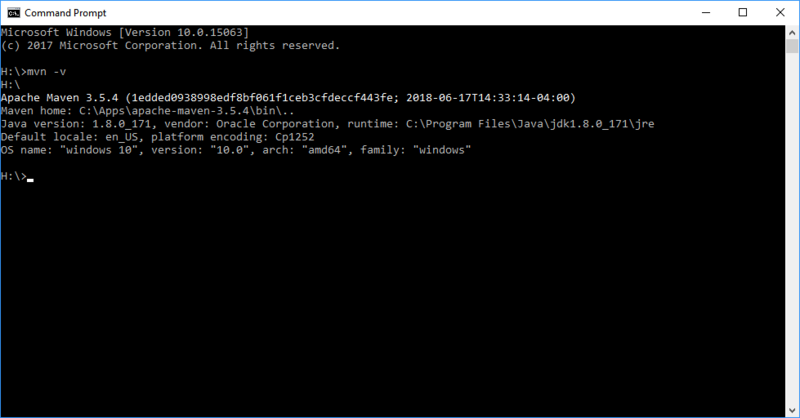 You might want to try a newer version of maven - I recently ran into an issue similar to this where the settings.xml file would not properly parse using maven v3.3.x. I upgraded to maven v3.6 and this worked without any modification of the settings files. Sure, I will try that and let you know if something comes up. One thing that bothers me here is that do we have to reinstall any other version of Java here, currently I am on Java 8. If a new java installation require, will it impact anything on the process? If you have Java 8 installed already, that should be fine. hi there. there has been some modifications in the environment. new configuration is O.S - CentOS 7, Java 8, Maven 3.6.0. Now I am trying to build the .war file but getting the errors. Attached are the settings.xml and Pom.xml for reference and the screenshot for error. Please let me know what i am doing wrong here. So this is strange, according to the error message, it’s saying that your settings.xml is malformed (expected a ‘project’ tag, got a settings tag’), as if it’s trying to use the settings.xml file as the actual POM.xml. So, it’s a little confusing about that. But the root node of a settings.xml should be ‘settings’ just like you have. I wonder if there’s a probelm with your ‘mvn’ command that you’re executing? mvn command worked fine. the issue I found was that POM.xml file was missing from Maven home, which fixed the error that I had on my above post and came across a new error. I validated the POM.xml and didn’t find any special characters so far. Please help. Sorry, I do not understand this: you should not need to copy any Pom.XML files anywhere. 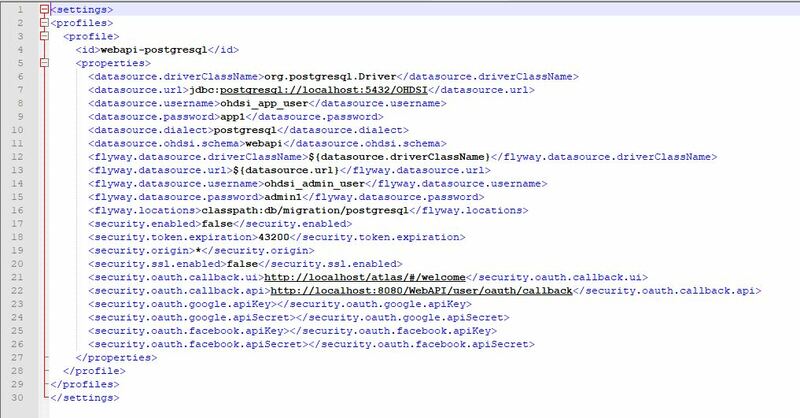 You should have the root of the WebAPI directory which has the pom.xml, and then you specify the path to settings.xml via your mvn command. I’m not sure what the ‘maven home’ has to do with this. Also, from the error, it is indicating which files it is unable to parse (the one under /jackson, for example), you should check the file in that location. I’m guessing that it downloaded an HTTP error response and not the pom.xml file for that library. Ok, please let me know if I am doing something wrong here. I fixed the files and there is another error which I am not sure of. Kindly suggest if I am doing it the correct way. Also with the error I can see there are too many discrepancies within the jackson’s folder’s pom files. Try running maven from the WebAPI directory (i.e. the directory in which you clone the WebAPI git repo and in which the project POM should be located, as per @Chris_Knoll above). E.g. Thank yo so much for correcting me. But I landed up on a different error overall. And the line 184 where it is locating the error, I am unable to understand what is the issue with that line. I also re-downloaded the xml files by calling mvn clean. Please let me know if you have any solution to this one. I tried the step to delete the files under /root/.m2 and maven did restarted download when I invoked the query. And again I landed up on the same error which I posted on my previous post. However, one thing I observed are couple of WARNING messages I receive during download. I am pasting it here so you can shed some light on it if it is due to network firewall or something else. Hi, @ambuj, I just did a ‘clean’ build on my side (by deleting everything under my .m2/repository, and ran my mvn build, and it successfully downloaded and compiled the war. My maven version is 3.5.4, could you paste a screenshot of what you get when you do a mvn -v? Perhaps this is a maven verision issue. I tried to clean up the /.m2/repository folder and redid the installation of files from repository and got the same errors as mentioned in WebAPI installation issue. here is the screenshot for mvn -v.
And, I also see errors when the fresh files gets downloaded, so I am assuming that my network firewall is blocking something…Let me know your thoughts on this, whether its maven version issue or its a firewall situation. I think it’s a firewall situation. Is there any way you can get a clean connection (not proxied) to the internet and try again? yes, I will try to do that and let you know if I come across any issues with it. @Chris_Knoll, well,nothing changed after removing the firewalls from the network. So, I am confused at why the url have such error. Hi, I noticed the same responses on my side when going to those URLs. However, running the maven command does not result in the same error that you have. 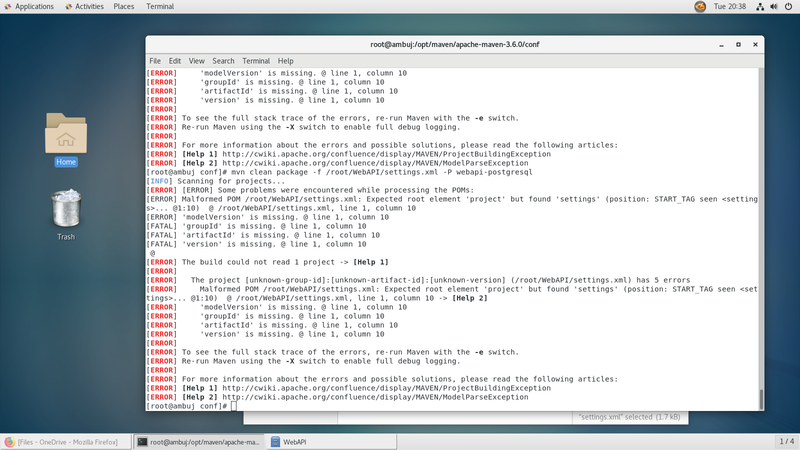 However, I’m running on a 3.5 version of maven. and you are 3.6. Is there a way you could install the 3.5.3 version of maven? Otherwise, i’m sorry, I do not know what is going on in your environment, but i can not reproduce it.